Robert Kraft does not want you to see the videotape of his visits to Orchids of Asia Day Spa. 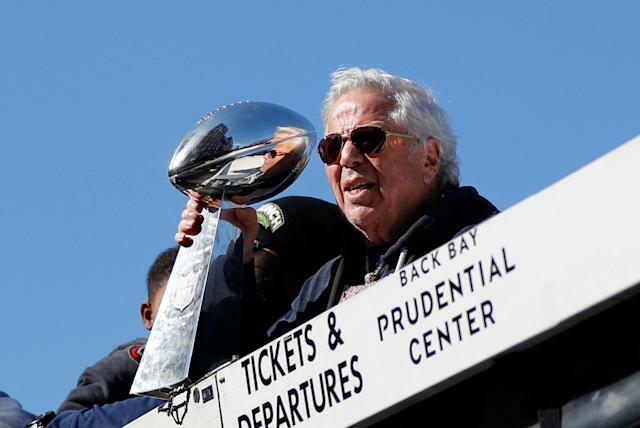 The sheriff who led the prostitution and human trafficking sting that ensnared the New England Patriots owner says Kraft might not get his way. Earlier this week, Kraft and over a dozen other defendants who have been charged with solicitation filed a motion in Palm Beach County Circuit Court to have the surveillance videos of their actions blocked from release. But Martin County Sheriff William Snyder said on Thursday that may not happen because to him there’s no legal reason to seal them from public view. Kraft has been charged with two misdemeanor counts of soliciting prostitution, and pleaded not guilty. He is due to appear in court on Thursday. It also notes that since the case is ongoing, the videos are currently exempt from public disclosure. But once the case has been closed, Snyder said he would follow Florida’s open-records law, and he believes other authorities would likely do the same. The Wall Street Journal reported this week that Kraft and others had been offered a deferred prosecution deal; but the deal was reportedly a “non-starter” for Kraft because he would have to review the evidence and admit that if the case went to trial he would be found guilty. If Kraft accepted the deal, the videos would remain sealed. Could the sheriff be trying to send Kraft a message? As in, take the deal or they’ll come out? According to police, Kraft visited Orchids of Asia on Jan. 19 and 20, paying for sexual services from a different woman each day. Police in Jupiter, where Orchids is located, had several hidden cameras in the facility.